Would-be entrepreneurs are set to receive free financial advice and business start-up tips from a Mansfield firm of chartered accountants. 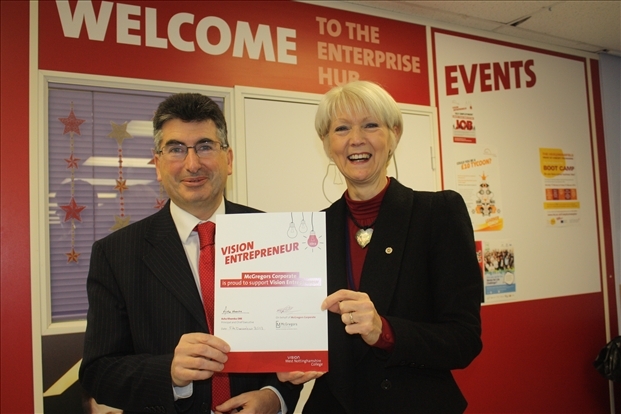 It comes after McGregors Corporate became the latest company to sign up to West Nottinghamshire College’s enterprise scheme, Vision Entrepreneur. The link-up will see the company – based at the i2 Centre on Oakham Business Park – provide monthly advice surgeries and one-to-one mentoring for people wanting to get their enterprising ideas off the ground. Aimed primarily at prospective sole traders and those wishing to launch a small business, the finance and accountancy sessions will cover topics such as book-keeping, invoicing, cash flow, overheads, profit margins, paying staff, registering for VAT and types of business formation. The surgeries will be held on a drop-in basis while the individual coaching will be through referral by the college. Starting in the New Year, they will take place at the enterprise hub at the college’s Derby Road campus in Mansfield. Chris Holder, managing director of McGregors Corporate, said: “In order for Mansfield and Ashfield to grow its economy, we need to encourage more young people to develop the skills to launch and successfully run their own businesses. Cate Hunt, enterprise and employability manager at the college, said: “We’re delighted to welcome McGregors Corporate to our Vision Entrepreneur programme. We both share a passion for nurturing the job-creators of tomorrow and this partnership strengthens our package of support. Launched in September 2012, Vision Entrepreneur sees aspiring tycoons from the college, schools and local community receive business tips and coaching from industry experts at a series of monthly events, which also feature inspirational guest speakers ranging from local entrepreneurs to high-profile national business figures. Those whose ideas have the most potential receive one-to-one mentoring and the backing to develop their plans further. To date, three businesses have successfully launched as a result of support provided through the scheme.